Our Via Alpina walking holiday is in the beautiful country of Slovenia. This particular Slovenian hiking vacation, you can enjoy walking in Slovenia and explore the Via Alpina Trail. Hiking in the stunning Slovenian Alps, you are pretty much guaranteed wonderful alpine views. The Alpina Trail is a collection of different grade walks. However, none of them has a climbers rate. In general, you will walk mountain ridges, mountain meadows, valley floors, slowly descending from east to west. This could just be one of the best hikes in Slovenia. Our walking tour generally follows the international Via Alpina track – the purple trail section. Your starting location is Jezersko, which means “place with the lake”. When the glacier melted after the last Ice Age a large lake was formed which remains to this day. From here you walk the Via Alpina Trail to the world famous Bled. Here you can see the famous lake which has an old church on an island in the middle. Why not stay an extra nights in Bled where you can have time in the town or explore with a further walk. You will discover hidden mountain valleys, wander over beautiful mountain pastures and stay in a tranquil mountain village. What more could you want from a walking holiday in Slovenia? We also have a wonderful walking holiday in the Julian Alps. More for you to explore in this beautiful country. Arrive at this small romantic village which is situated on the Slovenia – Austrian border, north of Ljubljana. It’s setting in a basin is among the peaks of the Stone Alps which makes it a perfect starting point for this trip. DAY 2 JEZERSKO to ČEŠKA KOČA loop walk 4.4 miles, 7 km, 5 hours, 640m ascent. Today a warm-up hike to the Česka koča mountain hut. 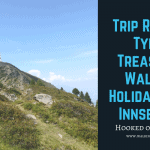 This short walk leads up to just above the tree line to one of the oldest alpine huts in Slovenia, which is around 100 years old, where you will be blessed with an outstanding view into the two parallel valleys. Your return route takes you past Shepherds Lake and back to Jezersko. DAY 3 JEZERSKO to GOLI VRH 8.7 miles 14 km, 5-6 hours, ascent 700 m.
Today you hike up the northern side of the Kamnik Alps’ to Goli Vrh. A meadow and forest walk brings you to an amazing viewpoint above the Jezersko valley. With one foot in Slovenia and the other in Austria, you’ll enjoy the splendid view of Grintovec range arena. After returning back to your hotel you will be transferred to the little town of Preddvor. A slightly more demanding yet wonderful walk today. Full of splendid vistas full hike. It begins with an ascent up to St. Jacobs church, which in days of Turkish raids served as refugee fortress and shelter. The walk continues through deep fir and spruce forest and across steep hillsides covered with alpine flowers to Hudicev borst, where a picnic at a hut can be enjoyed. After a full days walk you can refresh in Crnjava lake just before returning back to your hotel. DAY 5 (car transfer) PREDDVOR – LJUBELJ – BEGUNJE 7.8 miles 12.5 km, 4 hours, descent 700 m, ascent 250m. You will be taken by car to the starting point at Ljubelj, on the Austrian border. From here the trail leads through a short underground tunnel originally dug by merchants in order to reduce the travelling time between Carniola and Carinthia. As you emerge at the other side the trail then follows the old shepherd’s route before entering the peaceful Draga Valley, which takes you on your final leg into the historic village of Begunje. Begunje is also the hometown of the famous Slavko Avsenik / Oberkrainer band. 2kms down the road are the ruins of Kamen Castle. DAY 6 BEGUNJE to BLED 11.5 miles 18.5 km, 5 hours, descent 300m, ascent 275 m.
After days of hill walking, the morning hike across upper Carniolan plain will be a welcome and relaxing change. The only slight ascent takes you to St. Catherins church. Castle of Bled is already fully visible from here but to reach the town don’t miss the short diversion through the stunning 1.6km Vintgar Gorge, carved 150m deep into the mountains by the Radovna River. DAY 7 (car transfer) POKLJUKA – USKOVNICA SADLE – LAKE BOHINJ 7.5 miles, 12 km, 5 hours, ascent 200m. Today you will be driven by car up to the Pokljuka Plateau from which you will begin your hike across mountain pastures, passing old farmhouses, soon you will come to a viewing point providing outstanding views into the Bohinj Valley. As you descend you can stop at the little historic village of Studor where you can visit the museum and see how people lived 150 years ago. Your final destination is Lake Bohinj, the jewel in the heart of the Triglav National Park, and the small settlement of Ribčev Laz (Fisherman’s Pass). End of tour or extension of stay in Bohinj. This tour is in high mountains but with shorter walking days and not so many uphill walks. The walking tour is graded level 2-3 as some optional walks are longer and more demanding.